Contract formation, implied terms, contractual interpretation, damages, duties of care – these are all areas of the common law whose development has been influenced by construction law cases. In some of these cases the eminent British jurist, Lord Dyson, former Master of the Rolls, had a front row seat. In his 2015 Keating Lecture he outlined the significant contribution construction law cases have made to the general development of the common law. This speech is now featured in the Building and Construction Law Journal, Vol 32 No 3. With a disarmingly self-deprecatory manner, humorous turn of phrase, and personal anecdotes drawn from decades of practice in the area, Lord Dyson takes readers on what he describes as a “whistle-stop tour” as he considers some of the most important British construction law cases. In a number of these cases he appeared as counsel. He appeared in Courtney and Fairbairn v Tolaini Brothers (Hotels) Ltd  1 WLR 297 in which Lord Denning MR affirmed the centrality of the requirement for agreement on price as a constitutive element for a valid contract. He also appeared in Governors of the Peabody Donation Fund v Sir Lindsay Parkinson & Co Ltd  AC 210 – “another of my failures” – a case which was a “turning point” leading ultimately to the cementing in common law of the principle that in determining the existence of a duty of care consideration should be given to what is fair and reasonable. Other construction cases surveyed by Lord Dyson include Young & Marten v McManus Childs  1 AC 454 (reasonableness relevant to whether terms are implied), Ruxley Electronics v Forsyth  3 WLR 118 (damages are to compensate for a loss, not to provide a gratuitous benefit to the claimant party), and Rainy Sky SA v Kookmin Bank  1 WLR 2900 (commercial purpose/common sense may aid contractual interpretation). Lord Dyson brings an incisive legal mind honed through many years of practical experience in the area and leavened with personal insight, to delineating the paths by which construction cases helped shape the common law – and he does so with wit and humanity. 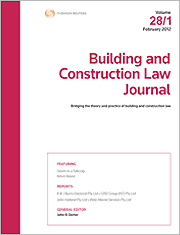 For insights and analysis bridging the theory and practice of building and construction law, you can get your copy of the Building and Construction Law Journal here. Building and Construction Law Journal articles are available on request by completing the Individual Article Sale order form and emailing it to tlranz.journal.orders@thomsonreuters.com.